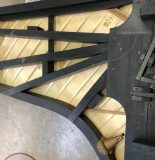 Restoration Of Grand Piano - Queen's Hall. The home of the performing arts community. 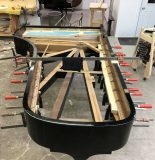 Restoration of a forty-year old Instrument like the Queen’s Hall Steinway Grand Piano is a job that must be placed in experienced and capable hands. Michael Lipnicki Fine Pianos of Calgary, Canada has been a repairer, maintainer and tuner of Grand Pianos for Queen’s Hall since the early 1970s. The NGO, Patrons of Queen’s Hall, was instrumental in assisting Queen’s Hall in 1978 with the purchase of this great instrument. 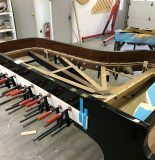 Over the last forty years, minor refurbishment was conducted on the Steinway, but it was apparent that the Grand Piano was in need of a total restoration. Queen’s Hall was forced to remove the Piano from use because of the many complaints from pianists and producers that the sound was thin and unsatisfactory and could be distracting and damaging to their musical productions. 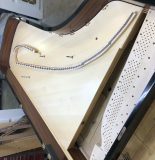 It was clear that restoration of the Steinway Grand Piano would satisfy Queen’s Hall’s clients and patrons, as well as facilitate the maintenance of a valuable asset for the Hall. 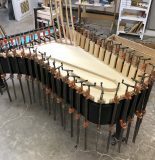 The restoration process which began in July 2018 has involved shipping of the Piano to Canada where it is presently being restored using genuine Steinway parts. Queen’s Hall is joyously awaiting the return of its Steinway D 9’ foot Grand Piano in time for the celebration of the Grande Dame’s 60th Anniversary in 2019.